Too "artistic" for political history, too political for the history of art, the visual history of the campaign for women's suffrage in Britain has long been neglected. In this comprehensive and pathbreaking study, Lisa Tickner discusses and illustrates the suffragist use of spectaclethe design of banners, posters and postcards, the orchestration of mass demonstrationsin an unprecedented propaganda campaign. I was very pleased indeed to get this second hand book, which is first rate. I originally borrowed this book from the library but had to give it back! So I was very pleased to find a copy on Amazon.It is packed with detail about the work of women artists (the spectacle) during the Suffragette years and the impact their posters, leaflets, cartoons, banners etc. had on the end result. I was particularly interested in one artist, Mary Lowndes, as we have one of her stained glass windows in our local church, and it was great to be able to find out a lot more about her through Lisa's book. A very detailed study, with great references and plenty of extra notes. Thank you! 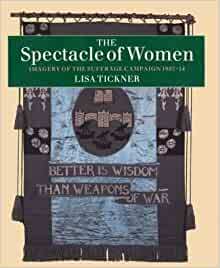 this book is a must for anybody interested in the suffragettes and how they use spectacle through marches, propaganda methods they used - the photographs give a great insight into the world of the protesting suffragette. The presentation of the banners shows the visual imagery used to inform the general public of their cause. The accompanying text gives detail of the different events and which movement/s were involved.